Yahuwah has bestowed rich gifts upon His people on earth. One of the most intriguing, yet least understood Heaven-bestowed gifts is that of speaking in tongues. Many Christians today believe that unless a person has received the “gift of the Holy Spirit” and can “speak in tongues” he or she has not yet been “baptized by the Spirit.” Speaking in tongues is used as a test to prove whether or not a person has been saved. The “speaking in tongues” that is practiced by many Christians today when they say they are praying or worshipping, is contrary to genuine, Biblical speaking in tongues. The disciples were given the job of taking the truths of salvation to the entire world! To enable them to do this, Yahushua promised that they would be gifted with the ability to speak in “new tongues” or in other languages. 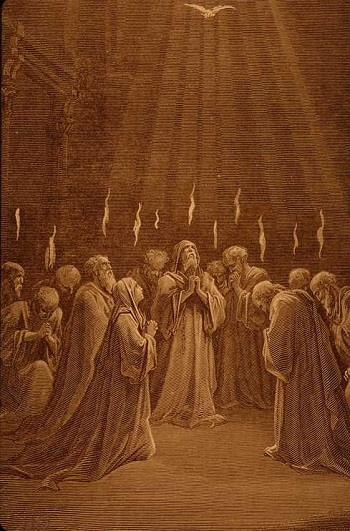 This unique gift was first bestowed on Pentecost and led to the salvation of thousands of precious souls. “When the Day of Pentecost had fully come, they were all with one accord in one place. And suddenly there came a sound from heaven, as of a rushing mighty wind, and . . . they were all filled with the Holy Spirit and began to speak with other tongues, as the Spirit gave them utterance. “And there were dwelling in Jerusalem Jews, devout men, from every nation under heaven. And when this sound occurred, the multitude came together, and were confused, because everyone heard them speak in his own language. Peter’s sermon was understood by all present, regardless of their native language. The result was beautiful. 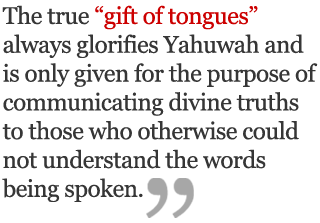 The true “gift of tongues” always glorifies Yahuwah and is only given for the purpose of communicating divine truths to those who otherwise could not understand the words being spoken. 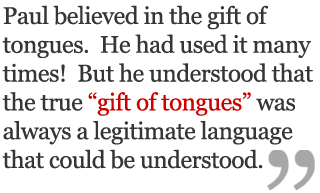 By contrast, the sounds uttered by many who today claim to have the “gift of tongues” is nothing but meaningless babblings. The sounds made are not distinct languages and they certainly do not instruct any in truth and righteousness. In fact, the glossolalia, or “speaking in tongues,” practiced by most people today directly contradicts the guidelines given in Scripture that reveal whether it is genuine or false. Paul understood that all language is a divine gift given expressly for the purpose of communicating. But if one person does not understand what the other person is saying, communication does not occur! Any language then becomes simply a jumble of meaningless sounds: idle babblings. At one time, the believers in Corinth were in danger of coveting the gift of tongues for the same reason many today desire it – they believed it made them appear more holy and important. Paul quickly set them straight that speaking words which no one understands does not communicate truth and thus does not fulfill the original purpose for why Heaven gives the gift of tongues in the first place! “But now, brethren, if I come to you speaking with tongues, what shall I profit you unless I speak to you either by revelation, by knowledge, by prophesying, or by teaching? “Even things without life, whether flute or harp, when they make a sound, unless they make a distinction in the sounds, how will it be known what is piped or played? “So likewise you, unless you utter by the tongue words easy to understand, how will it be known what is spoken? For you will be speaking into the air. Paul went so far as to state that if the language being spoken was not understood or could not be interpreted by someone else present who also spoke that language, than the person “speaking in tongues” was to remain silent. Paul believed in the gift of tongues. He had used it many times! But he understood that the true “gift of tongues” was always a legitimate language that could be understood. The “gift of tongues” is just that: a GIFT, given by Heaven, for the express purpose of communicating truth to others. Paul encouraged the Corinthians to “Pursue love, and desire spiritual gifts.” (1 Corinthians 14:1) However, Heaven’s gifts do not come on demand. They are given only to those who, in humbleness of heart, are filled with the Spirit of Yahushua and do His work. Not everyone is given the same gift and no one is given the gifts of the Spirit who uses them to glorify himself. 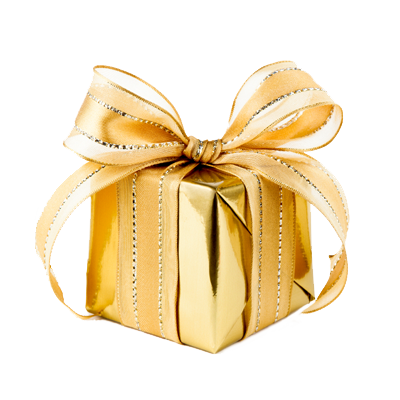 The gifts of the Spirit are given to those who have first revealed the fruits of the Spirit. Heaven is more willing to bestow the gifts of the Spirit than are fallen humans to receive them. All who will humble their hearts, and seek full obedience to the will of Yahuwah, will be blessed with the fruits of the Spirit. Then, when Yahuwah needs them, He will gift His children with the gifts necessary for them to complete His will on earth. Babbling, either in worship or in prayer, serves only to glorify the one claiming to have the “gift of tongues.” It does not edify or instruct in righteousness anyone around if no one can understand what is being said. Such senseless babblings only reveal a lack of the fruits of the Spirit which must necessarily accompany the gifts of the Spirit. Love, patience, and kindness are lost when one glories in his own self-perceived importance by babbling nonsensical sounds. The prayer and worship that is acceptable to Yahuwah is that which comes from a heart full of love, for such a heart is filled with the Spirit of Yahuwah. Let everyone seek to glorify the Father which is in Heaven, and the Father who sees and knows all will use the humble of heart to glorify His holy name and spread truth and righteousness throughout the earth.